Grain elevators in Barnsley, MB, July 2017. Contributed by Steve Boyko. 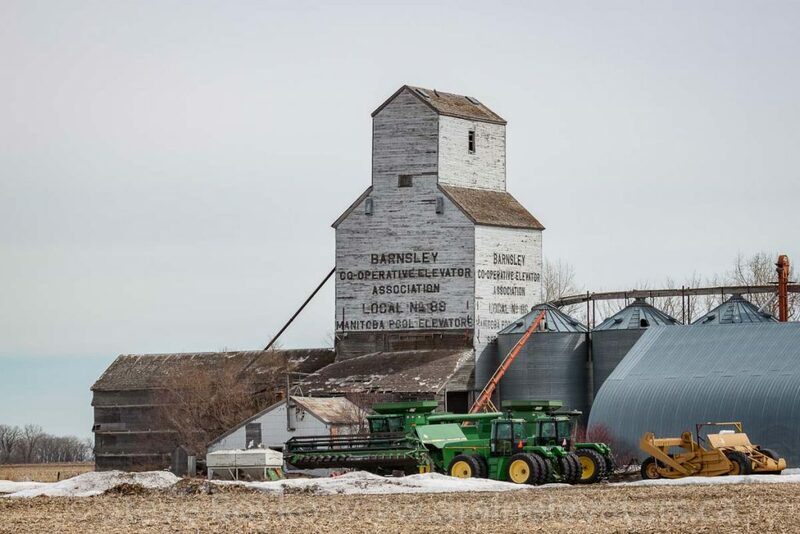 The tiny community of Barnsley, Manitoba sits between Carman and Elm Creek. At one time, Barnsley was served by the Canadian Pacific Railway via its Carman subdivision (Barnsley was mile 6.0). The rail was taken up but the Barnsley grain elevators remained. There are two elevators present today. Pool elevator in Barnsley, MB, Apr 2014. Contributed by Steve Boyko. 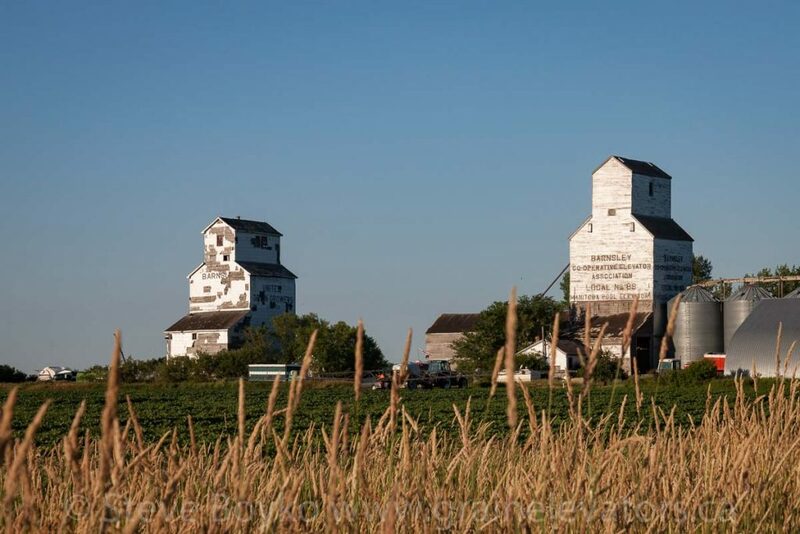 The first is the Manitoba Pool grain elevator #88. This elevator was not sheathed with tin like many other Pool elevators were, as both elevators in Barnsley were surplus to the Pool by the early 1970s. They were sold to a private farmer, who resold them to another local farmer. Barnsley UGG grain elevator, Apr 2014. Contributed by Steve Boyko. 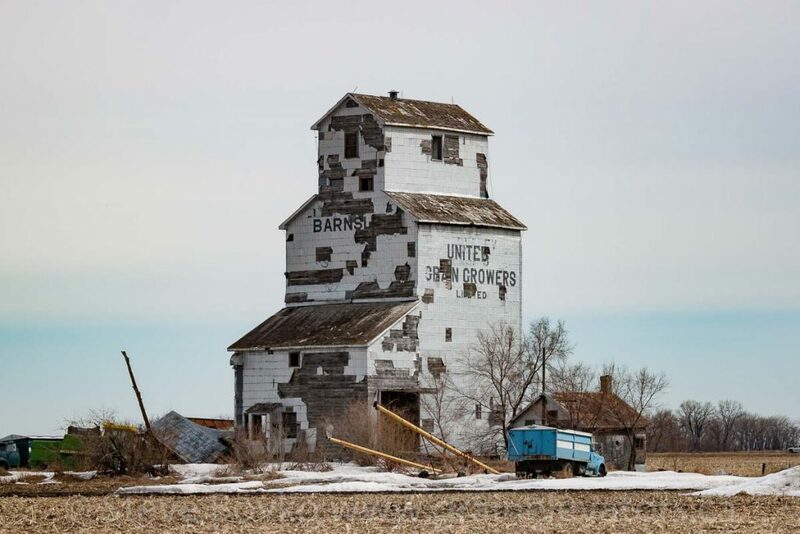 The second is the United Grain Growers (UGG) elevator, which appears to be in worse shape. It was built by the Manitoba government in 1916 and leased to the Grain Growers’ Grain Company / UGG until 1926 when UGG purchased it. The Manitoba Pool took it over in March 1960 and labeled it as “Pool B”. It’s nice to see these elevators apparently still in use. There is a photo of the Barnsley Pool B elevator in Greg McDonnell’s book Wheat Kings: Vanishing Landmarks of the Canadian Prairies .